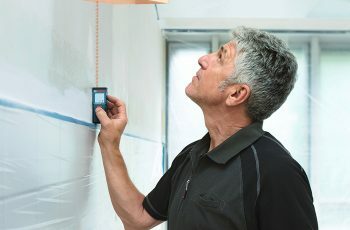 If you routinely find yourself having to strip wire for your job or around the house, you know how time-consuming and difficult this can be without the proper tools. This is where a high-quality pair of wire strippers can come in handy. 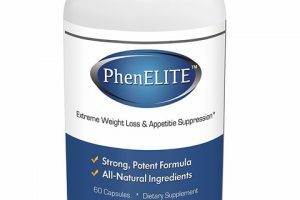 They can help you complete your job quickly and easily without scraping or cutting up your hands on the wire. 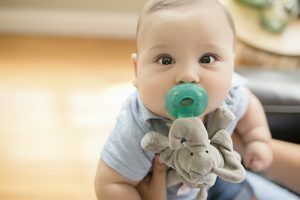 There are dozens of different brands to choose from, so we picked out and reviewed 10 different brands. Our short buyer’s guide will give you important considerations to remember when you’re buying your new wire strippers. How easy your wire stripper is to use is an important consideration. 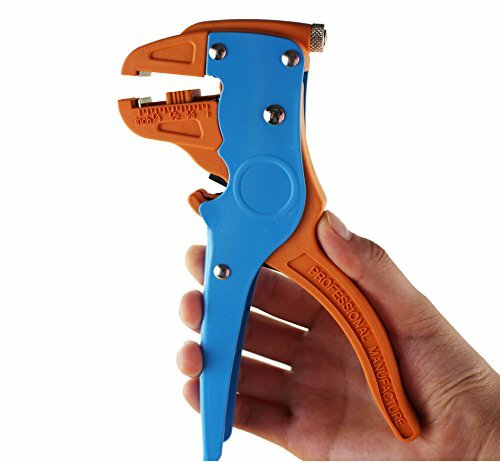 Having a wire stripper with an automatic grip is an easy way to ensure you always have a good grip on the wire you’re stripping. Also, automatic wire stripping capabilities can save you time and effort. Your wire cutters should be able to securely grip several different wire sizes. Also, you want the handles to have a non-slip or a comfort grip coating. This allows you to get a firm grip and it reduces the chances of an injury. Rubber grips are great for providing traction as well. You want to buy a wire cutter with high-quality materials to ensure it lasts. The blades are usually made out of steel or aluminum, and this allows them to withstand repeated use or wear and tear. The handles should also be durable and have some form of grip built-in. 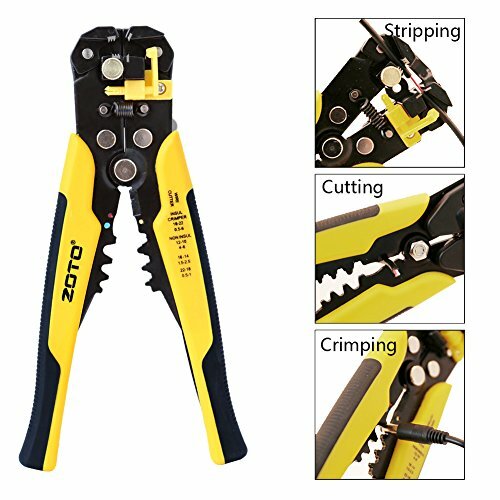 You can choose from seven different styles and cutting powers with these wire strippers. They’re capable of cutting, stripping, and looping 10 to 18 AWG solid and 12 to 20 AWG stranded wire quickly and easily. You’ll get a serrated nose that is perfect for gripping wire and stripping it. 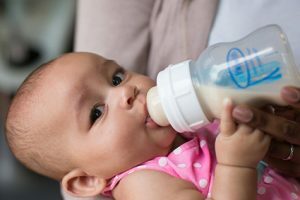 The handles are designed to be easy to grip and hold onto, and comfortable enough for extended use. They also have pre-punched holes for looping your wire. They’re made in the USA, and they’re held to very high standards. 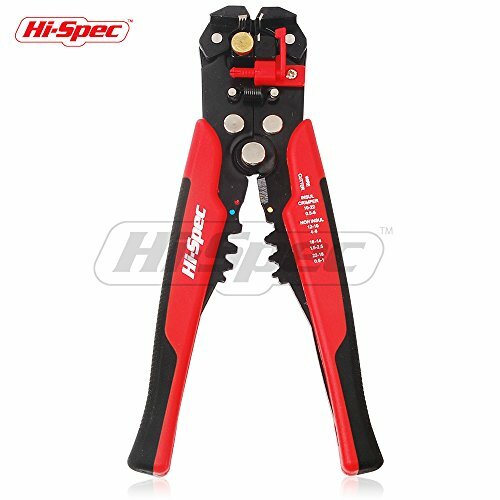 These wire strippers can work on wire ranging from 10 AWG to 24 AWG, and they have self-adjusting capabilities so you get the correct grip. There is a copper swivel knob that allows you to quickly and easily get the perfect grip on a wide range of wire. You can strip, cut, and crimp wire with this tool. There is an adjustable stopper that helps to control the length of the core wire. 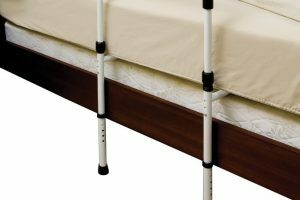 The handles feature a non-slip coating that allows you to get a secure grip even with extended use or tough wire. 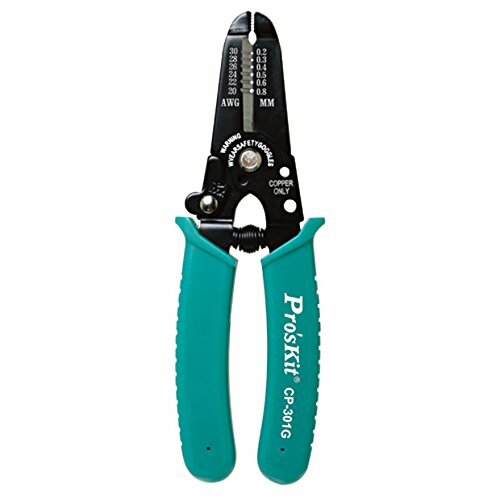 This small and lightweight wire strippers is the perfect tool for lighter gauge wires and precision work. 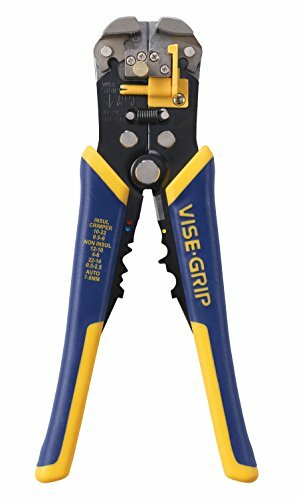 These wire strippers work with 20 AWG wire up to 30 AWG wire, and they’re designed to grip securely as you work. The handles feature a comfort-grip padding and an ergonomic design that fits to your hand. These wire strippers come in with a built-in safety lock so you can store or carry them without worrying about they falling open. The smaller design makes it easy to store them in a desk drawer. This multi-tool strips, cuts, and crimps 10 to 22 AWG solid copper wire quickly and easily. There is also a built-in screw shearer that can handle 6-32, 8-32, 10-32, 4-40, 10-24 and 5-40 screws quickly and easily. This tool comes with durable and long-lasting high carbon alloy steel blades. 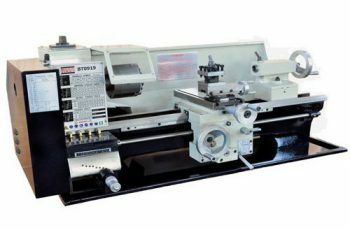 This guarantees that you get an accurate and precise cut each time. 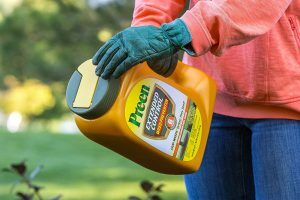 The handle has a non-slip coating, and they’re designed to be comfortable to hold and use. There is also a built-in bolt cutter so you can cut bolts to size. You can choose from the eight-inch wire stripper or the multi-tool design. These wire strippers can easily strip wire ranging from 10 AWG to 24 AWG. There is an adjustable built-in stopper so you can precisely control the length of the core strip. You can quickly and easily crimp 10-22 AWG insulated wire, 10-22 AWG non-insulated wire, and 7 to 9mm ignition terminals. They have a durable handle with non-slip coating for an additional safety precaution. 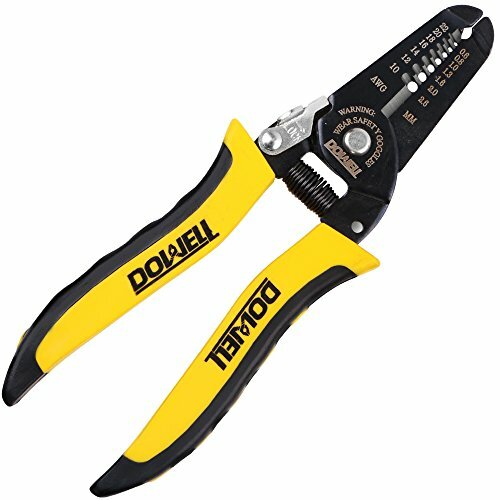 You’ll also get a lifetime warranty with these wire strippers to protect against damage or failure. This wire stripper is idea for copper or aluminum wire ranging from 10 AWG to 22 AWG. 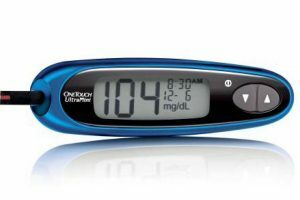 It is designed to have a very simple operation, and you can use them one handed without an issue. 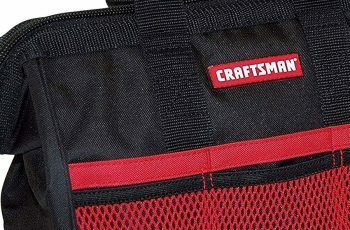 There is a built-in safety lock that keeps the wire stripper closed when you store or carry them. The handles are made with a PP+TPR material, and this makes it easy to grip and hold onto them, even with oily hands. They’re also designed to be comfortable to hold for extended periods of time. This wire stripper tool comes with self adjust jaws that allows you to quickly and easily strip wire ranging from 10 AWG to 24 AWG. There is also a thumb wheel that lets you adjust to wire smaller than 24 AWG and get a firm grip. The handles are a combination of comfort grip material and plastic, and they provide a non-slip surface. The crimper works on insulated and non-insulated ignition terminals. You’ll also get a wire cutter to streamline your jobs. It comes with a 12-month warranty and 24 hours a day customer service. You get a very narrow build with this wire stripper, and this allows you to quickly and easily get into narrow spaces. The blades will automatically adjust to the different wire sizes, and you can strip them with a squeeze of the handle. 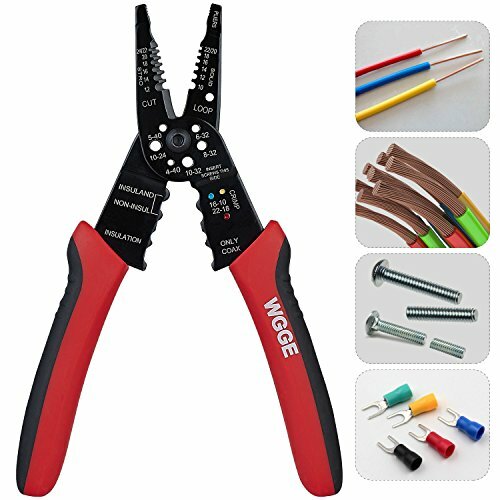 You can use this tool to strip wires up to 24-10 AWG, and you can also cut wires up to 12 AWG with the built-in wire cutter. It is made out of a combination of plastic and steel. The handles are wider and easier to grip. This wire stripper is made out of professional-grade materials. It has a very user-friendly design, and it’ll automatically adjust the jaw’s grip to the correct wire size. It’ll automatically strip the wire when you squeeze the trigger for a hassle-free use. You can use the knob to adjust the gripping potential to wires smaller than 20 AWG as well. 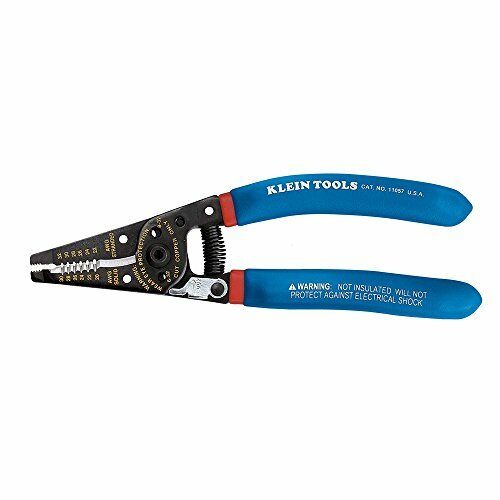 The blades on these wire cutters are made out of heat treated metal, and they’re sharp enough to allow for precision cutting. The handles have a soft easy-grip covering that’s comfortable for extended use. 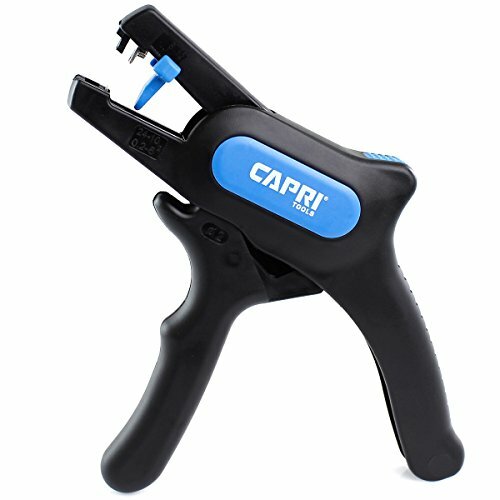 This tool works great on 10 AWG to 24 AWG standard wire or solid wire. They’re especially good for stripping speaker wire. 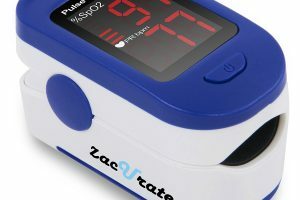 It has an adjustable stop system so you can decide how far you want to strip the wire. It comes with a replaceable blade system so you’ll always have sharp blades to finish your projects. They’re good for business professionals and do-it-yourself handymen. The handles are optimally spaced, and they’re easy to operate. You get an adjustment dial so that you can strip smaller wire quickly and easily. Wire strippers are an important tool to have in your arsenal whether you use them for a job or around the house. They can save you a lot of time, and a good quality pair can last for years. Our top 10 picks let you quickly compare them side-by-side, and our buyer’s guide gives you important criteria to keep in mind when you’re picking out your next pair of wire strippers.